This guide documents the events in Lore as they happened according to in-game chronology (that is, they are listed in order of occurrence in-game and not by release date) and may contain occasional spoilers. Read it at your own discretion. NB: Alternate names are annotated in parentheses. Certain quests lack encyclopædia articles. Quests that are not canon or deuterocanonical are and will NOT be included. Blue denotes a link. This guide uses Australian English and the Little Endian form for calendar dates unless otherwise noted. The Recommend Quest, War and Event Play Order following the Table of Contents is provided for your convenience and reference. If you so choose, you can read the quest entries as a substitute to playing through them by clicking on their respective links. The main storyline thus far is the Devourer Saga (many years in the making!). Prior to starting the Devourer Saga, it would be wise to also complete the following in any order (except the Darkovia quests; play the Darkovia quests prior to the Nightbane Chronicles). Travel Map > Zorbak's Hideout > Twilly vs. Zorbak > Twilly vs. Zorbak Part II > Zorbak's Trickery! To understand the events of the Devourer Saga (to a certain degree), do the following quests in the given order. Twilly > Hello! > Heard any rumors? Yulgar’s Inn > Go to Lounge > Sage Uldor > What do the Drakel want? Travel Map > Sail East > Stonerule > Speak to Artix > To Stonerule > Take a closer look... > The Return of Riona Shadowgale! Travel Map > Sail East > Sail Southeast > The Devourer Saga > Mount Thrall > Pod 1 > Relive the Battle to Save the Future! OR Battleon Inn > The Devourer Saga > Mount Thrall > Pod 1 > Relive the Battle to Save the Future! Read the following in the following order if you wish to understand Deren and the surrounding nations' interactions and who Glenn Galrick is. Also be sure to play through the Sinister 7 War after playing through Part 4. Do NOT play through The Nova Knight until AFTER the rest of the saga and WarpForce are completed. There are several other sagas in the game besides the Devourer Saga. Be sure to play them in the correct relation to the Devourer Saga. Notes are made below on the ones for which order matters. The Dracomancer Saga may be played at any time; however, be aware that The Dragon King occurs during the Devourer Saga and that everything preceding leads up to it. Everything after FireSpawn should be saved for after the Devourer Saga. Frogzard Hunter Quests 1-4 come before the Saga, as mentioned. 5 and onward may be played after. Prior to the Nightbane Chronicles come the first chapters of the Dracomancer Saga up to the point where Cyrus and Galanoth agree upon an uneasy peace for the first time. This is no longer in-game. The Drakel Civil War at K'eld Naer occurs after the arrival of The'Galin. After playing the Devourer Saga, several other Sagas come into play. To play them in the correct order, read the following notes. The Terrible Twelve War happens after the Sinister 7 War and after The Return of Stragath, Infernal Inferno, MetalFace's Lair, Captain Munch Attacks, the Hybee Hive Raid, and the Knight Class Quests. Paxia Under Siege happens after the Final Battle of the Devourer Saga. New Granemor has many interesting quests. Morgul’s in the Inn can be played whenever, so long as it’s after the completion of the Devourer Saga. 2: War for Darkovia > 5: NightReign VS. GraceFang! Play April Fools 2010 AND preceding April Fools quests (they return each year). 3: Star Blecch! > 5: Us vs. Regeirk! 10: The Final Countdown happens before The Father's Door. The rest of the Seekrat Saga should be played before 11: The Father's Door. The Truphma Saga may be played whenever, but the Paintball War occurs after the final Bizarre Flecks War (Mostly Harmful). The Elemental Orbs/Chessmaster Saga (starting with Lolosia Gets Iced: Snow White Beaches) directly follows events in the Devourer Saga. Parakkas Unbound follows Well of the Water Lord's Tears and the rest of the Devourer Saga. Big Scakk Attack follows the entire Saga, Dragon Morphs! in Dragonspine, and 2: Scouting Mission but precedes Kragoth Part 1. There are also some quests that have prerequisites unrelated to the Devourer Saga. Stretch of the Imagination follows Hungry Hungry Monsters (aka Innard Space). Play through these quests first, PRIOR to starting the Devourer Saga. The first ever war in AdventureQuest, this war sees the introduction of the Mysterious Necromancer. Beginning the first in a long line of wars and invasions that would soon befall the small town of Battleon. Make sure you read/play through these quests third, PRIOR to starting the Devourer Saga. The town of Battleon is invaded by the forces of the Great Fire Dragon, Akriloth. 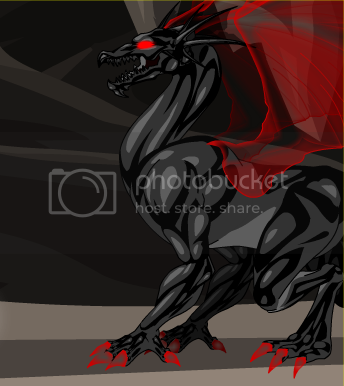 After driving out Akriloth's forces, the player learns from Akriloth that Drakath stole the Prime Fire Orb and is charged by Akriloth with retrieving the Orb and bringing balance to the Elemental Realms, the dragon promises the player it will make a great fire weapon as a reward. Upon returning the Orb, the player learns it was never Akriloth's to begin with and the dragon swallows the Orb, indeed becoming the most powerful fire weapon. The player is informed of the existence of an Ice Scythe that defeated great fire dragons in the past. The Scythe, however, is in the possession of an Ice Demon who upon defeat destroys it believing himself to be the only creature worthy of its possession. Fortunately Yulgar the blacksmith is able to forge a Frozen Claymore from the shards of the Scythe, with this the player slays Akriloth who explodes, the Orb itself breaking into shards scattered throughout Lore. Nifaria, the Elemental Spirit of Fire charges the player with the duty of looking after Akriloth's son to restore balance to the Fire Realm. Make sure you play/read through these quests fourth, PRIOR to starting the Devourer Saga. Quest for the Flame Guardian Armor! During the peacetime after Akriloth's death, the small town of Ashenvale is invaded by a small force of fire monsters. The town is saved before it is destroyed and rumours of the leader of the fire forces surface, a man named Drakonnan, Akriloth killed his parents and brother, driving him mad. Drakonnan gathered the Shards of the Prime Fire Orb and sought revenge against mankind. The nearby town of Moonra was also being assaulted, Drakonnan, apparently frightened and retreats, to resist his attacks and prevent him from fighting back the forces of Battleon search for the Flame Guardian Armour, forged by one of Yulgar's ancestors. The armour is retrieved and the invading forces pushed back. While everyone was gone Drakonnan launched an invasion on the eastern hills with a force lead by a small number plasma dragons he forced to the surface causing a fissure of energy flowing to appear. The plasma dragon invasion was only a diversion, Drakonnan's main force invaded and destroyed Battleon, in the chaos Demento, Galanoth's brother, was killed in a battle with Varax, one of Drakonnan's generals. Drakonnan's forces are fought back and Varax is killed, Drakonnan becomes enraged and kidnaps Galanoth and many of his allies before retreating to his volcanic fortress. Afterward, the player learns of the Ice Katana, a weapon which controls the powers of Ice and is able to freeze monsters. The Ice Gems are retrieved and the Katana forged by Yulgar. After Drakonnan's forces were defeated, the kidnapped Artix von Krieger was transformed into a Shadowfire Knight by Drakonnan. As the army of Battleon ventures into the surrounding caves of Drakonnan's Fortress, his remaining minions are flushed out and the player eventually confronts and defeats Evil Artix who reverts back to normal. With Zorbak's help the player frees Galanoth, Smbdoll and the others that Drakonnan had kidnapped. After the mega fire orbs powering the fortress are destroyed, the treasury is unlocked and the Ice Katana retrieved. The player uses the Katana to defeat Drakonnan who plunges into a pool of lava, this victory is short-lived, however, as Zorbak only assisted the player because Drakonnan possessed his desired chair. In an attempt to gain possession of the chair, Zorbak offers Drakonnan the fire orb which the latter bonds with, absorbing its power and transforming him into "UltraDrakonnan" a giant flaming demonic version of himself. With Zorbak's assistance, the player defeats him once again (yet his fate is unknown and it is later shown in the Sinister Seven War that he survived the ordeal) and Zorbak opts to take Drakonnan's helm as a chair instead. Quests from "FireSpawn I — Lair of the Lava Drake" should be played AFTER completion of the Devourer Saga. Firespawn II — The Return of Limkragg! A threat of another dragon war looms over Battleon; Galanoth, head of the DragonSlayer Order and Lord Cyrus, High Khan of the Dracomancers, came to loggerheads over a past battle. After agreeing to set aside their squabbling, Cyrus calls for the hero and Galanoth's order to fight a band of rogue dragons in order to protect Battleon and prevent these dragons from posing a bigger threat. Bradakhan, a corrupt Dracomancer of greater power than Cyrus, arrives in Battleon demanding Cyrus surrender his position to Bradakhan. 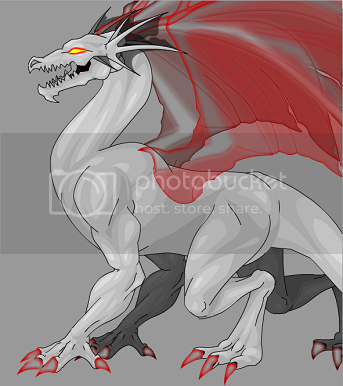 Cyrus refuses and Bradakhan brings out a void dragon who holds his sister, Sheila, captive. Bradakhan gives him an ultimatum: step down or see Sheil, perish. The hero and Galanoth lend their support in a mission to infiltrate Bradakhan's fortress and rescue Sheila, they succeed, but are noticed by Bradakhan who begins his invasion of Battleon. Play through the entire Carnax Saga second, PRIOR to starting the Devourer Saga. Read through these encyclopedia articles BEFORE starting the Devourer Saga. Play through these quests BEFORE starting the Devourer Saga. NightReign and GraceFang are born! Resistance is Feudal should be played AFTER The First Door but PRIOR to The Second Door. Read through the April Fool's Quest articles PRIOR to the beginning Tangled Web of Fate, please note that April Fool's 2007 occurs DURING the Devourer Saga. April Fool's following 2010 are unessential, however, have been included for continuity. April Fool's 2009 - The God must be Loco! April Fool's 2012 - No Tricks this time... Really! The Frogzard Hunter: Quests 1-4 should be played PRIOR to completion of the Devourer Saga, Dinozard Island and subsequent quests should be played AFTER completion of the Devourer Saga. DO NOT explore or interact with the inhabitants of Isle d'Oriens or the Isle itself, make sure to read through the books in the Library, but apart from that DO NOT interact with the inhabitants of the Isle or the Isle itself, doing so will spoil the events of the Devourer Saga. Battle for the Salvation Weapons! The following quests do not occur in any particular order. A new power of the Devourer? Falerin's monologue from the 10th Anniversary event, quoted here for reference (with some edits for spelling and grammar), provides a concise summary of what is the largest quest chain in AdventureQuest's twelve-year history. The planet of Lore has a long and convoluted history. Its history has been marked by trials, tribulations, trials of tribulations... And the occasional migration of evil Helifino winds that have marred the land with great woe and sorrow. The goddess Lorithia created Lore long ago. This, however, is not Lorithia's story, at least not directly, although she does appear toward the end as a gross deus ex machina to explain away inexplicable plot inconsistencies. Many millennia ago The'Galin, the son of Galian, was born in the City of Tjeli, on the Continent of Inilar. Now in those times, the people were full of corruption, and The'Galin was a kind and good individual who sought after the welfare of the poor, the beaten, and the downtrodden. Unfortunately, public works were extremely unpopular among Tjelish bioethicists, who measured the value of the person based upon what good they brought to society- And who measured the good one brought to society based upon how much money one brought into the community coffers and how much esteem one brought Tjeli as a whole. In this regard, the son of Galian was a multiple failure. For he had no love of money, and he sought to aid the poor and the weak even founding an orphanage to help those children that Inilar's capital had already deemed as worthless. Now Lorithia, the creator goddess, who had imbued herself in her creation, despaired over the corruption that had risen within it. She began to believe that there was no good left in the world, and that her creation was a failure. It was then, however, that she happened upon The'Galin son of Falian, and seeing his good works, she saw within him a purity of purpose and noble nature, unlike the sinful world around him. Therefore, the sought to know him better. Assuming mortal form as the woman Lauren, Lorithia came back to the world of her creation, and there the met The'Galin son of Galian and she grew to love him. As time passed she became his wife, and she his husband, and they expanded their public works substantially raising a family from among Lore's most dejected citizens. Even one of The'Galin's most hated adversaries came to appreciate the goodness of the man and stood by his side. Nevertheless, while The'Galin won the favor of foe and goddess alike, Tjeli itself remained a cold and hostile place. Moreover, the evil Tjeli grew ever more virulent, suspicious, and hostile. The citizens of this city unleashed a great evil, and when the weapon was unleashed it led directly to the death not only of several of The'Galin's beloved children but of his beloved wife Lauren as well. Frightened for his remaining children and despairing of the excesses of the Land of his birth, The'Galin set out for the continent of Deren. There he founded the first version of the City of K'eld Alorin with some of the ancient ancestors of what would one day become the Drakel. In Alorin, The'Galin sought to form a school of knowledge and of growth that would become open to all. However, unbeknownst to him the educators in the city had been influenced by outside factors, and when the king of all Deren, the good king Draynor- By that I mean the first one to bear the title, not King Tralin's adoptive father, so I guess "Draynor I" in Terran terms... When Draynor was killed, the citizens of Alorin fled in fear to Vandar the continent of the north, and there they sought to isolate themselves from all the world, in defiance of the wishes of their founder. The'Galin son of Galian, however, had far worse problems. In the aftermath of Draynor's death, Draynor's son, who was young and impressionable, Delkirk, was convinced to turn over the son of Galian as a political prisoner. Therefore, The'Galin was extradited back to the land of his birth, where he was put on trial for Crimes against Progress by the people of Tjeli, and was found guilty. ...As if there could be any other conclusion from such a farce of a trial. He was sentenced to death by execution. Lorithia, however, restored of her divine state when her human form was killed, looked upon her once husband and felt not only great love for him, but great pity for her creation that had so fallen into corruption that it would do such a vile thing. After all, it clearly had become very lost from here intentions for it if it had become so corrupted that it would do such a vile thing. It was clear that creation, left unchecked, had become corrupt and diseased, and that left unchecked this disease would spread throughout not only Lore, but through all worlds where she had held sway. And eventually, perhaps it would grow beyond the boundaries of her creation entire. In addition, she became aware that hers were not the only worlds showing such disruption in the creative spark. And so, Lorithia rose up her husband as a god, to stand beside her, and with the Elemental Lords, as the powers of Lore. The'Galin son of Galian was to become the Devourer of Worlds, The Uncreator. And his task was to be to balance and cull from creation, to root out and correct corruption, entropy, and decay, where such was possible. And where it was not... to make it so that they had never existed in space and time in the first place. Among his first actions as Uncreator was not an act of uncreation, but was instead an act of preservation. The'Galin could not uncreate Tjeli, as its corruption led to his ascension. If he removed them from creation as they deserved, he would initiate a paradox. By force of will alone, the Devourer tore the city of Tjeli off of the continent of Inilar, and cast it into the southernmost extremes of the ocean, where the city became encased in thousands of feet of ice. And here the citizens of the city were to dwell for all time, as phantoms, denied passage to the world beyond, and preserved as a record. This was a lesson. Fall so far into corruption that uncreation was not an option, and the alternative would be FAR worse. The'Galin was a good man though, and he believed that this would teach and prevent the need for him to act further as Uncreator, a task that he detested as against his very nature. A good man though The'Galin was, he saw the corruption and the damage that it did. Therefore, he raged against the city of his birth and against the Drakel that he saw as betraying him. In his railing, he encountered a man named Xilar. Xilar was a Silari, an ancient desert Drakel species. Xilar sought to become a servant of the gods. However, as he and the Uncreator both learned, the same corruption that had infested Tjeli had likewise spread to the Temples, with the priests and clerics of the Lords actually attacking Xilar directly. The'Galin witnessed this attack, and seeing Xilar's nature, he selected the Silari to become his first Communicant. Now, The'Galin realized that the Elemental Lords had become blind to their followers' transgressions, if even communicants could behave so corruptly. But when he tried to tell them they would not, or could not, see. In fact, in the Drakel version of the legend it is claimed that even Lorithia did not hear him; though, both Lorithia and The'Galin have since denied this account to me. So, it is likely this is a Drakel embellishment. So The'Galin set about to prove this by example. He directed Xilar to go to Aloria, a city in the Outer Planes similar in nature to Sigil, the City of Doors, in Concordant Opposition. That is, a place where gods and servants live together. The The'Galin directed Xilar to do what was necessary to convince the Brilhado, servants of the Light Lord, of this corruption, with the hope they would convince the Lady of Light. They heard Xilar, and they believed him, seeing much of the danger he said was in Creation. But when they spoke to the Lady, such was her faith in the original creation that she still could not or would not hear. So Xilar, thinking that he might aid them, advised them to go to her husband, the Lord of Darkness. But he only rebuked them for faithlessness. Despairing of the Lords as well, and taking The'Galin's admonition to convince them at all costs quite literally, Xilar decided that he could convince them of the danger of the corruption only by spreading it to Aloria. So Xilar convinced the Brilhado as servants of the Lady of Light that the danger was vast, and he convinced them to become necromancers, though necromancy had always been previously the domain of the Dark Lord. This alone would not have been a problem, though the Drakel later claimed that the Brilhado initially rejected this as a forbidden art. However, given that the Lady maintains an army of her own undead, I very much doubt this claim. But Xilar also directed them to practice necromancy on those Brilhado who did not choose to become necromancers. Using the language of the corrupt he told them this would not be murder but rather granting them eternal unlife! The Lady of Light was horrified by this and cast out the Brilhado till they would repent of their ways, calling them Fallen. Xilar's attempt was successful, but its results were only to convince the Elemental Lords that The'Galin was dangerous and that his goal as Uncreator would destroy Lore. This is a position they maintained for millennia after, in light of all that happened, and only revised recently after Lorithia revelled fully the truth, both of her plan and of her directions for her husband. The truth is the The'Galin generally hates uncreation... though there have been exceptions, but it is against his character. Unfortunately Lorithia's plea and the experiences he had mean he knows it is necessary. Have there been times he actually enjoyed the role? Yes, I imagine that there have. And, given his position, uncreation does actually bring the Devourer the power that he frees from creation. So he does in that sense at least metaphorically "Eat" what he uncreates. But I am getting way ahead of myself. You see, we did not know that until recently. Even I was very wrong in my early assumptions. Now where was I... oh yes, Xilar. Xilar returned to Lore, and as the arm of the Uncreator brought not only the temples of the Drakel races to their knees but lead to the very disruption of those ancient races, with many being uncreated. Among the basest, the darkest that he had uncreated, The'Galin selected a few to spare. These he instead made join him, to follow him, as his servitors. Such races formed what has come to be called "The Network," and they were his great project. For he saw in them two opportunities: First as a lesson for the darkness of corruption, a way to spread fear of The'Galin's eventual return; and second as a chance at absolution. A lot of time has passed since then and The'Galin has come to Lore on multiple occasions. I cannot tell you about all of them for we would be here for years, literally. In one of the earlier occasions of his return, a good man named Garavin stood against The'Galin, believing him to be the monster that his actions, and those of his Network, made him out to be. Seeing his struggle, and knowing it deeply and intimately, The'Galin saw finally an opportunity. He declared several things. He prophesied that before Garavin would pass from Lore, he would know the Truth about The'Galin; that Garavin would fight him; and that Garavin would serve him. Finally, he declared that through Garavin, and his progeny, he would fail in his task as Uncreator, for the downfall of the corruption of Lore would be realized. Now Garavin, known as The Eternal, had a child, whose name was Celestra. The Network, on their [sic] last incursion of The'Galin, had killed Celestra's mother, and so she was filled with dark rage against the Devourer and his Network. She saw further what the "curse" that The'Galin had laid against her father had done and she, as fiery as her father was sanguine, became as much a force of transience as he was a force of solidity. She chased after the Network. From world to world she chased them, and so she also became known as "The Huntress" - for wherever the Network grew she fought them from within and from without. She learned then of a breed of creatures distantly related to the Drakel so removed from their normal physical forms that they no longer could live without a host. These beings were called Annunaki. Their leaders were called Avatar, for in the mythology of the Annunaki they were considered sent by the divine. She learned likewise that the effect of the curse on her Father had been brought about by such an entity. In symbiosis with her father as its host, it extended her father's life and increased his strength. The union, however, was not at the physical level but at the level of the soul, and so if the being left it would tear its host's soul in the process. This would render the host into a half-life state, an odd form of non-necromantic undeath, called "being Forsaken." Much more information on the Forsaken can be found in the story of the Shadow Erebus, for Erebus did manipulate a group of Network beings called the Alpha to become Epsilon. But I digress. In spite of the risk to her mortal soul Celestra sought to become not only the host of the Annunaki but of the Avatar of Transience, for it fit her nature. Therefore, Eternal and Transient became Avatar, and not merely Annunaki. While the Annunaki were many, the Avatar were few, ruling in an oligarchy. Just five original others joined in their efforts as Avatar. In the Avatar's struggle against the Network, and in the aftermath of Erebus' involvement, Truth was torn in two a process that some say drove it mad. The second half of Truth was known as Lies. This brought the number of the Avatar to an even 8, and Celestra noted that this number matched the number of Lore's primal elements. Realizing that this could give them a foothold the each chose one. The Avatar focused on their element entirely and mastered it, so that they became a mirror of Lorithia's creation. This they used to gain a foothold on Lore. In the years since, the Avatar have fought the Network from within and without, and other than Celestra and Garavin each has been forced to change hosts many times, Forsaking their old host in the process. Which brings us rather fully to the most recent incursion of the Network against Lore. Within the Network arose three generals: one Terran, one Brilhado, and one from the distant planet of Vesperia. The Terran was very unusual in that he was never corrupted. Rather The'Galin saw the man and sensed a kindred soul. He explained his mission and the man joined him willingly. The Terran, Doctor Louis Zephyr, was to be the eyes of the Devourer on the many worlds. A brilliant mind, he started a school for those with gifts, not entirely unlike the School The'Galin had tried to form in K'eld Alorin long ago. Interestingly, it is the Drakel who finally realized The'Galin's goal on Lore, both in the new version of Alorin and in the Derenian School of Thought. But I digress. The leader of the Brilhado was a cold, exceedingly loyal man known as Diviara Celegra. He'd lost his wife, a very good woman, to the corrupt of the Network, and they framed him for the process. Diviara's brother Giliara and son Amilara left the Network as a result. Giliara knew the truth and begged Diviara to follow, but in his loyalty he refused. So both brother and son were turned against him. Giliara fled to Lore, whereupon he eventually encountered King Tralin of Deren, and became a servitor of the Lady of Light again - the first Brilhado to join her ranks since the original fall. Amilara was a powerful necromancer, like his father, but one who did not see the undead as tools but rather as a form of Life in their own right, especially after meeting some beings that had been born that way. So Amilara, like Celestra the Huntress, began shadowing the Network, and the Brilhado in particular, with the goal of liberating the undead. This led him to many worlds, including my homeworld of Caelestia, where he was among the first to master the Undead forest of Immertot, and ultimately, when the Network discovered his behavior, to Lore. The Vesperian's original name is unknown for as a very young man he too, was cast to Terra. There on Earth he originally was named Charuske Ryuusei, though a man named Twain adopted him. The name "Twain" is apt, for forces and choices led Ryuusei to separate into two temporal analogs - two "what ifs," if you will. I am not certain what the original dividing force was, but I have strong suspicions that The'Galin does. From the same slate they grew, but the analog raised by Twain became cold and corrupt, and the other one was sent to a distant alternate Terra where he lived among the humans there. Only the former joined the Network. The elder Twain was a Network leader in his own right while he lived, and one who had the idea the Vesperians were gods, which is why he adopted Ryuusei and renamed him. As to Vesperia... I can find now record of what happened to it, nor even that it ever existed. The only Vesperians I have encountered, excepting the analog of Ryuusei, have been in the Network. Which suggests much in and of itself. I suspect, though I have not had the temerity to ask, that The'Galin uncreated Vesperia, and that is why it no longer exists. The elder Twain and his Ryuusei created an organization called N.O.V.A., a title that means Network of Vesperian Agents. It is actually from this organization that the practice of calling The'Galin's followers "The Network" likely originated. N.O.V.A. as an organization has never come to Lore in and of itself, though its members have. It has been active primarily of Terra and it was there that Atlas Maxwell, who was among the Avatar, met, fought, and joined them. It was likewise here that my former Avatar Galrick met them. Which I suppose means we come to how I got involved in this story to begin with. I originally learned of The'Galin when the shadow Erebus invaded my home world and took the guise of Tholeon Webb. Erebus changed my world's history, totally messing things up before the changes were undone. Seeking to trace Erebus I found the Alpha and the Network, though I did not know at the time that Erebus WAS the being they called Epsilon. I traced them back to Lore... I arrived here sometime after his last departure, and it was here I met Garavin and helped construct the Isle of D'Oriens. I continued my research for ages, gathering every book and legend I could. Erebus has subsequently let slip things that suggest he knew I would end up doing so, and that he deliberately manipulated the situation so that I would get my information on The'Galin from corrupt sources. Consequently, I was very wrong. I believed the Drakel lie, and given The'Galin himself encroaching on Lore became concerned that Caelestia was endangered. Seeking limited permission to act from Lorithia and the Elemental Lords, and in return giving the Lorian pantheon, including The'Galin, limited Caelestian access on my own terms, I sought to thwart him. Diviara, who use "the Cold" on him, a powerful psychic attack that amplifies emotions and thoughts. Myr was so loyal, however, that he refused to be misled. But at my advice Myr began an elaborate deception where he pretended to have fallen, even assaulting his allies in the process. Ultimately Myr was instrumental in defeating a plot by Diviara and the Network to gain control of a pocket of raw creation at The Deep beneath K'eld Ner. It was also here that I met a young Network soldier by the name of Galrick. Galrick's father Glen and most of his home of Neld had been decimated by Vandarian action, and so he called out in a rage and The'Galin answered. It was through Galrick that the gate to Neld the Brilhado utilized was opened, but upon seeing what the Brilhado brought Galrick was horrified. Seeing his doubt I convinced Galrick to play double agent. Galrick was a brilliant mind, and I sent him to Terra, not knowing fully of N.O.V.A. 's actions there. He went to University and became a Medical Doctor. Here Galrick encountered Gaiden Cartwright, Ryuusei's son. Though Gaiden had been raised not by his father, but by his father's analog. Galrick also encountered Ryuusei himself on several occasions and fought with him, a fight that had him come to Caelestia several times. He also encountered the Order, who were led by Atlas Maxwell. Maxwell was directly involved in the affairs of the Avatars Truth and Lies, and is the only being known to have served as host for two Avatar and still survived being Forsaken. Though Vampire Slayer E served as the avatar of Death, and was able to stick around for a long time due to deals he made with Death the demipower and more directly his servant the Reaper. And Edward's sister Cenara, who served as avatar of Death after him was saved from being Forsaken by the intervention of advanced moglin healing magic. The war of the Network involved seeking the prime Elemental Orbs, pure essences of each element, and trying to use them to control creation. In this process I learned the truth of The'Galin and began working to aid his true [missing word] In the battle that ensued, Giliara Celegra was killed by a disobedient Brilhado. In his dying breath Giliara repeated his plea that Diviara turn aside from the Network. Diviara struck down the Brilhado responsible and joined the people of Lore, directly stealing the Orbs from the Network in the process. Little did Diviara know that such was exactly what The'Galin would have hoped for Diviara. The Uncreator still sought redemption and absolution for "the Fallen" of the Network. Diviara has since become a very odd Triple Communicant, one of the few cases known of a person being a communicant of multiple powers at once. His main deity is the Lady of Light but he has served as a lesser Communicant for both the Lord of Darkness and The'Galin too. Fighting with creation, Diviara warned that the forces of the Network would come in force now. He further warned much worse generals were coming, and this was proven by Cartwright's arrival on Lore. Cartwright had become a Communicant of The'Galin with the intent of forcing its uncreation. Cartwright believed that Creation was beyond hope and directly defied orders to bring about his ends. He caused the death of Galrick, not knowing I had already made an agreement with The'Galin. And so Galrick became my Avatar, under the rules that since I was an Extra-Lorian power he was exiled, not to return without special permission. Which was a problem as he had met and married Celestra in this period. This was recently rescinded completely, however, in light of the fact that I became a Lorian Demipower, segregate of my Caelestian roles. In the climactic battle, Ryuusei became Omega, not only a communicant of The'Galin but a direct avatar and manifestation. He used his status as "taken avatar" to begin an assault on the Temple of Hope. What he did not know is that we had prepared for this, and that even The'Galin and Lorithia had done so, though the chose to forget their preparations so it could not be stopped. Lorithia is a pantheistic power. What this means is that she is within all of her creation, even the Avatar, and yet she is MORE than the sum of those parts. Hidden within creation, therefore, was the cause of its salvation. We brought together all of the Elemental Orbs, the building blocks of Creation. Our most learned mages discovered a Hymn of Creation to activate them and the Index... the Temple of Hope itself. The final key to the puzzle was in fact a greater artifact know as a Spirit Orb, and King Tralin, as a communicant of Lorithia and Avatar of Life, had been entrusted with one, known as the Shield of Lorithia. 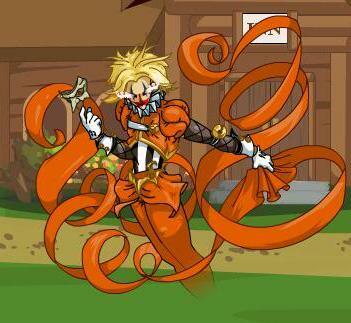 Among the Avatar, Tralin was odd in many ways. Not only was he an Avatar and a Communicant, by being an Avatar when he was already a Drakel he was most odd. Only Twig as the Avatar of Peace was more unusual. When Omega attacked the Chosen of Lore, the Hymn of Creation activated the Statue of Lorithia, and Lauren manifested as Hope - an "Avatar" of Creation. The'Galin at first denied her arrival and called it a trick, but when she spoke the blinders fell away from his eyes, too, and he left Omega, abandoning him. Ryuusei was subsequently dropped deep in the Void. Ryuusei has since returned. The'Galin has taken him back, too, after signs of moderating his past behaviors. Though his current whereabouts are unknown. One wonders what The'Galin was thinking. 8: Looking for Leads: Ku Ku! 14. Light in the Darkness! Guardian-only — You may play "The AntiGuardian!" and "The Tomb of Awethur!" in any order, however, "The Return of Awethur!" should immediately follow "The Tomb of Awethur!" for continuity. 7: Absolix Rising and everything after should be played AFTER the Dracopyre Legacy quests up to NightReign vs. GraceFang. 5: The Mutant King Attacks! Quests from "1: The D.E.N.N.I.E. Phantom" should be played AFTER completion of the Carnax and Devourer Sagas, a lot of the content within will not make sense otherwise. Playing through WarpForce PRIOR to starting this saga is advised. The Bizarre Fleck Saga happens after the Final Battle with Absolix. In addition, the entire Saga should be played in synchronicity with the Dracopyre Legacy up until Darkovia Ultimatum (Darkovian Ultimatum occurs after the Fleck Saga) and until the completion of 5: Us vs. Regeirk!. The rest should be played AFTER the Dracopyre Legacy. 5: Shadow War — The Other Side Unleashed! BONUS RELEASE: What if we LOST the Terrible Twelve War? The Paintball War should be played AFTER completion of the Bizarre Flecks saga, everything else may be played at your discretion. For a more thorough overview of the suggested play-order see the second post. The schematic is courtesy of ArchMagus Orodalf. Fighting one of Lore's deities/demigods: [...] would be an interactive cutscene where you get to play out your character being squished. In any case, this guide is an attempt to organise the multifarious Gods that have appeared or been mentioned in-game. Dhe Ehmn - The Dhe Ehmn are classed entities that have realised their potential (unrealised Dhe Ehmn class entities would in fact be as weak as a normal human being); they are the creators of the game. Daniel and Stephen are important Dhe Ehm for Caelestia. Extra Greater Powers - Lore's Pantheon of Gods has no Extra Greater Powers, but Eldron and Falerin and the rest of the Farpoint could (at one point) be classed here. Greater Powers - Lorithia and Galian (or The'Galin the Devourer); Life, Death, Magic, and Creation on Caelestia. Intermediate Powers - Tirlerion is the Intermediate Power of Forbidden Magic on Caelestia. There are no known Lorian IPs. Lesser Powers - The Elemental Lords are Lesser Powers. Demipowers - War, Death, Pestilence, Famine, Balance, Destruction, Creation, Chaos, Order, Serenia, Kethorat, and others. Normal Human Beings - Self-explanatory. The Gods mentioned below have been placed next to their classes above. Note that these rankings are pantheonic-- they have no bearing outside of a given pantheon. Lorithia is the Goddess and Mother of Creation, also known to the Drakel as the "Spirit Lord". She is a deity created by the Dhe Ehm who, in turn, created Lore. Lorithia believes firmly in free will, and says that, on the whole, Creation was basically good and worthy of continuing, despite The’Galin saying that Division was a large problem. Lorithia will not violate free will, for Creation is pointless without it. The Lords follow this viewpoint. There are a few known Avatars of Lorithia. One is an Avatar like the Faceless leaders mentioned above (but is not a Faceless). This is Hope. Another was Lauren, Lorithia’s form when she first met and fell in love with The’Galin. Her (only) Communicant is Tralin, who is also King of Deren. In terms of her function: Lorithia notes the manifestation of the Engine of Creation, passing on its locations to the Elemental Lords, who then use it to create a new world where the Engine deems it necessary. Creation’s greatest enemy is I, for Creation’s greatest enemy is itself. I come to test and to destroy and hope only to fail utterly as I failed in life. For in failing, I shall succeed. Those who know this and understand may come to understand me. Be ready; I am coming for you, and I shall not be merciful. Born to his father, Galian, on the continent of Inilar, The’Galin is the Greater Power of Uncreation (His public name was Aledrin-- in the society in which The'Galin lived, if birth names were given, power was exchanged). The’Galin from his humble beginnings was a caring man, setting up an orphanage for the children of Inilar. Through this job, The’Galin met Lorithia’s avatar, Lauren. The two fell in love, and Lorithia eventually bestowed Godhood upon him. To him was given the duty of testing worlds, traveling through the Multiverse to check for Division and Chaos, Uncreating those he deems too Chaotic. As with the Lords and Lorithia, there is an Avatar that has the power of The’Galin. This Avatar is Omega. Omega has manifested in Xilar and Ryuusei Cartwright (aka Robert Twain). On the Network: The Network is a body of the agents of the Devourer that travels with the Devourer to sow Chaos and Division. The’Galin detests their kind, for they represent that which he hates most in the world. However, they are kept near him because he feels that they need him more than anyone else. On the Network (Special part): There are four leaders in the Network that had their own agenda: Jarik Z’kaa, Z29K, Queen Naaseria, and Dark Madder. These Network agents are those fought in the WarpForce expansion. Reading the Journal of the Uncreator would be instructive if you wish to know about The'Galin's history. The Elemental Lords are the Eight Lesser Powers that govern the Elements. Contrary to popular belief, these deities are not constantly at war; that was a lie spread by Xilar (communicant to The’Galin and Avatar of Omega) to invoke Division and Chaos among the Lorians. In WarpForce, more of the nature of the Lords is revealed. 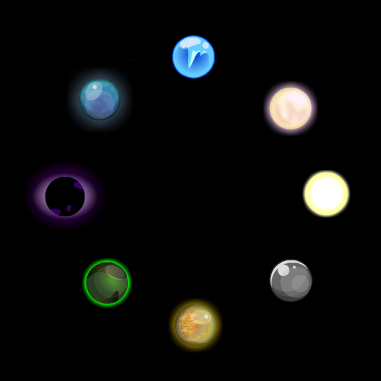 At the creation of each new world, Avatars of the Eight gather with their moon-sized Engine of Creation, which channels the Elemental powers of the Lords and creates the matter of the new world. Each world has a different set of Avatars to create it. There are many Avatars of the Elemental Lords. Above, two sets of Avatars are depicted; the picture in space depicts the Avatars of a world in the Cryptic Veil. The other depicts the Avatars of DragonFable’s Lore. Another important set of Avatars is the set of “Avatar” that were stressed in the Devourer Saga. These Avatar are Avatars of a different sort. They are the leaders of the “Faceless,” reptilian therianthropes that have the power of the Lords and help in fighting the Devourer. Life, Death, Peace, War, Lies, Truth, Eternal, and Transient are their names, representing Light, Darkness, Ice, Fire, Water, Earth, Energy, and Wind. 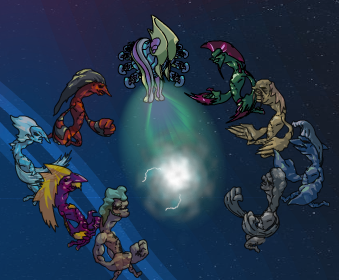 These Avatars inhabit Tralin (Life), Twig, possibly Twang (Peace), Mercuria (War), Danail (Lies), Kaliope (Truth), Hans Olo (Eternal), and Celestra (Transient). Previous Avatars include Edward (Death), Balius (Death), Riona (Lies), Cenara (Death), Maxwell (Truth), and Garavin (Eternal). In the future, Lies will inhabit Anna and Truth Makkisar. Other Avatars of the Lords are less well-known/seen in-game; the major known Avatars are those of the Light Lord. Giliara, Commander Paladin, and Cagliari Lux are examples of these. Other avatars include beings like the "Sentinels" (like Nalu, Sentinel of the Water Realm, or Garom Kachare, Prime Sentinel of the Light Lord) and beings like the Lightbringers (who were called "demigoddesses" by Lucius, leader of Clan Lucian). Several Communicants of the Lords also exist. Giliara was a Communicant of the Lord of Light (he has been replaced by Diviara), Myr is a Communicant of the Darkness Lord, the governor of the K’eld on Deren (Lord Darin) and Cerin are Communicants of the Water Lord. Notes: Several monsters in-game are described to be one or another of the Lords' Avatars; examples include Fuuryoku and Aquus. Cultural Notes: Drakel are forbidden from aligning with an Elemental Lord, for doing so is said to bring on Uncreation. There are, however, renegade mages who have aligned themselves with an Elemental Lord. Elsewhere, however, there are many temples to the Lords. Loco is Lore's demipower of mischief and fortune. Around five thousand years ago, Loco nearly started a God war by pulling a prank on Baldric. To avoid a devastating god war, the Elemental Lords sealed Loco away in another dimension. Every April 1 (April Fools Day), Loco’s place of imprisonment reconnects with Lore, letting him wreak havoc and mayhem around this time. (Loco is not, in any way, related to Loco Strongarm, Caelestia deity of War.) Look under Seasonal Events for Loco’s escapades. See "Caelestian Deities," below, for Falerin's biography. The Four Riders, also known as The Endbringers, The Apocalypse, and The Four Horsemen, are a set of four demipowers that rule over the four aspects of Famine, Pestilence, War, and Death. Performing acts that their names suggest gives them more power. Specifically, the BURP Wars give power to Famine and Pestilence, spreading disease gives power to Pestilence, wars give power to War, and the act of dying gives power to Death (and, in fact, Death lets pretty much everybody that dies go, giving him more power as they die again). Together, they balance Lore; presumably, they all have opposites. Famine: Famine is Serenia’s “brother,” and his name is Adel Gazamiento (which, without the space, means “thinning” in a Terran dialect known as “Spanish”). He balances Lore by succeeding Fertility in years that he must; in other years, his sister succeeds Fertility. Famine seems to be the Rider that least wants to act to destroy. Pestilence: Pestilence is behind all of the plagues and diseases that exist in Lore. For example, Pestilence once created the “Harmonic Plague,” or the “Black Deaf.” He worked with Famine to create (and pressured him into) the BURP Wars, taking champions like BlackWhisker, the Seekrat, and the Pied Burper. War: War was behind much of the fighting between the Dracomancers and Dragonslayers, using one of his Avatars, Jalek, aka the Dragon King, to cause fighting between them. His other Avatars, Mayhem and Carnage, worked to bring War into the realm. He was eventually thrust out of Lore by the Avatars of Limkragg and Ser’Mathis. Death: It would seem that Death is the strongest of the Four, due to the excessive number of deaths on Lore. He has yet to show his full manifestation on Lore; we have only seen two of his Avatars, Death the Boatman and The Reaper. As a servant to the Boatman and an immortal being, Silence falls here. There are Five aspects in LORE that are represented by Draconic, rather than humanoid, demipowers, namely those of Chaos, Order, Destruction, Creation, and Balance. They are not often worshipped by humans; their greatest following is among the Vartai. The Vartai celebrate four great holidays around the year dedicated to the Draconic Avatars – at the start of spring, there is a festival for Creation, at the start of summer, there is a festival for Order, at the start of autumn, there is a festival for Chaos, and at the start of winter, there is a festival for Destruction. Balance is Limkragg, and Cyrus is his Avatar. Ser'Mathis, Draconic Demipower of Destruction, has chosen Xerxes as his Avatar. Nava, too, is an Avatar of one of the Dragons; of which, it is not known. It is possible that Sheila and Gaspar, too, are Avatars. Kethorat is an ascended Demipower-- like Falerin, Eldron, and The'Galin, he existed as a mortal before becoming a deity. Little is currently known, aside from the fact that one can currently call upon his powers as a Dracomancer. Serenia is the Demipower of the Harvest and appears once a year (around the time Terrans call Thanksgiving) and flies over the world of LORE to restore the fields to their former beauty. Lorians must give offerings of crops and plants to her so that she may bless the harvest, and ensure that there is enough food for the winter. She is Famine’s “sister,” and succeeds Fertility in years in which the seed takes root and grows. Fertility is a Demipower keeps the fields of Lore fertile and green. Fertility hasn’t much of a presence in-game; a brief mention of Myrakul Grao, one of Its Avatars, is about all that was mentioned. Even less mentioned than Fertility is Sylvanus, the Demipower of the Plant Kingdom. At the Harvest Festival, Tendral, one of his servants, tells us that Sylvanus offers the inspiration and guidance that lets plants grow. Therlion the Mad was the original Creator of Caelestia. He used his powers to create the plane and shape it to his will, but he did not stock it with life. Afterward, he went to sleep “under a nearby rock” for 99998376 years, 8 months, 12 days, 3 hours, 26 minutes, and 2.706 seconds. Other deities from other worlds expanded their own power by colonizing Caelestia. When Therlion woke, he found the world not to his liking and manifested three Avatars to attempt to balance the world: the Man in White (pure Good), the Man in Black (pure Evil), and the Man in Gray/Red (Balanced). This was a very bad idea. The Man in Black, Evil and disrespectful of his Creator’s wishes, attempted to usurp the Creator’s position by causing numerous Caelestian and God Wars. At the conclusion, all of the previous Gods of Caelestia were ousted and the Man in Black was imprisoned in a demiplane, as he had gathered too much power to be dismissed. The world itself was placed under the charge of four Greater Powers: Oxalis, Chrysalia, Aslyn, and Prometheus, who were in charge of Death, Life and Healing, Magic, and Creation and Innovation, respectively. The extra-dimensional affairs of the world, on the other hand, were placed under the control of the Farpoint, a directive to prevent the influence of extra-Caelestian deities that had mucked up the world to begin with. The Farpoint consisted of Mariel the Hermit, Serian, Falerin (see below), and Eldron (see below), Extra Greater Powers of Chaos, Law, Evil, and Good, respectively. Finally, Therlion was relegated to the position of Demipower of Diversity. The Farpoint maintained its power for ages, keeping their enemies in the Prison of Ages (later broken) and tightening the borders of Caelestia so that only those with the Farpoint’s permission could enter. Eventually, the borders and other rules (like those prohibiting chronomancy) were relaxed to allow the Good Dhe Ehm to attempt to shape the world for the better. Falerin was the former Loremaster of Lore, being succeeded by Eukara Vox and Nel following the Absol-ution Saga, and the Caelestian Extra Greater Power of Evil. His symbol is a spider clutching a decahedral gem. Following the Absol-ution Saga, he ascended to the Lorian pantheon, adding "Lorian Demipower of Lore: Discovery, Knowledge, and Secrets" to his portfolio. Falerin is, however, an ascended deity; he did not have his position to begin with. He started out as an apprentice to Dralen Ath, magepriest to the Spider Goddess Lolth, who had a portfolio both in Caelestia and another world, Toril. Dralen planned on taking Lolth’s position by combining his power with that of some of the gods of Toril to kill the Goddess. Falerin betrayed Dralen’s plan to Lolth, who then gave Dralen’s position to Falerin. Falerin eventually ascended to the rank of Demipower, and then worked with other Caelestian powers to oust Lolth. Falerin was then given the position of God of Evil. Falerin has many Avatars; several are Falerin, The Traveller, The Sojourner, Arden, and Lanfiré Dupre. The Falerin Ardendor seen on Lore is actually Falerin directly. After Seth Cay Dhows’s actions on Lore, Falerin died. After his death, Dhows took control of the fragment of Falerin controlling his body, known as “Ardendor” to distinguish from Falerin’s true intentions. With the Chosen of Lore's help, however, Falerin was reincorporated and also managed to take control of his analogue "E."
Eldron is the Caelestian Extra Greater Power of Good. Eldron, like Falerin, is an ascended deity. In the Zardian eZine column "Fighter, Mage, Thief," Eldron was a Caelestian Grey Elf, son of King Mythron, apprenticed in magic to Ramalad. The exact details were never fully explained, though it seemed that Eldron was destined to become a God of Good. Furthermore, it has been revealed that Eldron is not truly the son of Mythron, but the son of the Caelestian God of Elves, taking this God's portfolio and followers following his departure from Caelestia. Players are Dhe Ehmn too... You in the real world direct your characters. So all of the characters have the same Dhe Ehmn and while they may be totally unrelated in this reality in the prime reality they are related through you. An ascended Dhe Ehmn is not a fanboi it can be a god or even a mortal that somehow manages to be boosted to another level on the tree. This can have untoward affects. It is unlikely we will ever fully explore this in game though Falerin makes tongue in cheek reference to it. On Caelestia, there are several lesser Dhe Ehmn, who are very powerful because they come from a reality more prime than Caelestia but they are NOT prime dhe ehmn. Arguably Falerin is in fact more powerful then most of them, and even when he is not more powerful he is more knowledgeable. All of these Dhe Ehmn are themselves under a prime Dhe Ehmn, many of them are under Me. Dhe Ehmn is in fact a word of comparison. If a world was less prime then Lore. Lorians would in fact be Dhe Ehmn compared to them. There is a story written by Eldron and I in an older Zardian issue that references a visit from a more Prime Terra to caelestia of two young boys who are Dhe Ehmn prophesied to come. The story does not spell it out for you but it indicates it. Not all Terra's are more prime. The Terra, that Galrick is on is at the same level as Lore and Caelestia. Likewise the Terra that Ryuusei grew up on... pretending to be native. It gets complicated unto headache inducing levels. Anyway the link above directly mentions the Dhe Ehmn and even explains them in more detail but never tells the boys that they apparently are Dhe Ehmn. Q. What is an Avatar? I heard about them in the Devourer Saga, but what are they? A. There are two types of Avatar. One type are the ones mentioned in the guide, the real-world manifestations of Gods and Demipower. The other type are the leaders of the Annunaki, named Eternal, Transient, War, Peace, Truth, Lies, Death, and Life. A. The Communicant of the Darkness Lord. He appeared in Frostval 2012: The Freeze-gion of DOOM! Lore is an interesting planet, but Lore isn’t alone in its existence as a planet filled with life and magic. Ever since the coming the Devourer The’Galin, Lore has been increasingly exposed to life from other planets, with good will or bad. This section documents all of the planets that we have encountered hitherto. It is important to note that these planets are not confined to the WarpForce expansion and are, indeed, of direct interest to AdventureQuest players. Many already have noticeable effects on the game and others, like Lore, Trescol, Kairula, and Balen-5, are visitable in AQ. If you don’t wish to join the WarpForce to view these planets, just click on their names for a snapshot. For those worlds that can fall in several categories, merely their names are re-listed. All of these worlds are currently visitable in AQ. Lore is a planet of inordinate magic—its core is pure, strong, elemental magic— and variety in geological features. Unlike certain worlds that exhibit only one type of living space (e.g., Satiren for its ocean, Erakkis for its desert, or Kairula for its jungle), Lore has all of these characteristics and more: it has oceans (the Egrian, the Great Southern) like Satiren, deserts (the Skraeling) like Erakkis, jungles (the Dark) like Kairula, forests, tropical regions, mountains, and even snowy regions to the north and south. A note on this geography, however, must be made: it is liable to shift. Greatly. In very short amounts of time. Because of this geological variety, there is also much variety in its inhabitants; the sentient species are manifold. Of these, there are the humans, the Elani, the Ulgathi, the Drakel, the Gnome, the Mermazon, the Dragon, the Dwarf, the Moglin, the Gatta, the Centaurion, and potentially many more. There are also many non-sentient species much like those on Terra, like the Tiger, the Bat, the Hawk, etc. In addition to its importance for its magic and variety in creatures, Lore is also important because it was the birthplace of The’Galin the Devourer, the WarpForce’s greatest enemy (sort of). The’Galin was born aeons ago on the continent of Inilar in the capital city of Tjeli. As a man, he started an orphanage on the Cigeli Peak. It was in this life that he first felt the depravity of Creation-kind. After his death, Lorithia raised him as a Greater Power to test the worlds and to determine which are worthy of continuation. Lore is one of the only planets for which we have any idea of what its Gods are like. Lore is also important because the game happens there, in case you didn’t know. Further Reading: Why not play AdventureQuest and discover more about this world yourself? If you need help understanding the many Gods, try looking here. Trescol is a planet with three suns. Due to its orbit around these suns, there is no true “night” on Trescol excepting the “Great Night,” Ahb Solis. During Ahb Solis, the three suns align, flare, and cover Trescol in night. The dominant sentient race of Trescol are the Chairodontae*. Their general structure is much like that of the Centaurions of Lore, with a four-limbed lower body and a two-limbed torso. All of these limbs have deadly claws at their ends. They also possess a certain affinity for magic, as the Chairodontae have a third eye (“Oculum Aegis”) that allows them to see the shape of magical energy and to see into the Ethereal Realm. The females, however, are more skilled at manipulating their third eye, causing them to be their Tribe’s spiritual leader; the males are more physically strong and are their Tribe’s warriors. In addition, the females are more fair-skinned and less suited to the harsh light of the three suns, and will remain in their dwellings while the darker-skinned males hunt. They have many interesting traditions—for example, the Great Night is also a night of a ritual of passage called Tanis. On this night, the Ancient Euthark will venture forth, and Chairodontae youths may hunt these Euthark to become warriors. Should they be successful, they will fashion a weapon, a Luntet, from the carapace of the Euthark. Should they fail, they will forever be banished from their Tribe and live as Par’Sha, Forgotten. Another such tradition is their method of housing. Shalut, types of mesas, are their general homes. Huts from red mud are built instead if no Shalut are nearby. Because of the WarpForce’s visit to retrieve “Floaty,” an F10A7, the Chairodontae of the tribes have been shown the evil of the Network and have allied themselves with the WarpForce. The Par’Sha, however, aligned themselves with the Network, believing that the Network can destroy the Tribes. Further Reading: Learn About and Visit Trescol! Also, try Finding F10A7 as well. Kairula is the second planet from its sun in its solar system. The core is composed of piezoelectric crystal (crystal that generates electricity under force). The surface, on the other hand, is covered with jungle where there is no ocean. The jungle is very dense, and the underbrush is near impassable. The humidity in this jungle is also extremely high. Because of these jungle conditions with excessively high humidity and temperatures, an insectoid race has evolved to be dominant. The Odonata* had ancestors not unlike the Terran damselflies. The Odonata, however, are of two different breeds: the Shalen and the Junas. They are as different as can be. The Shalen (the “tree-bound”) are a green, gossamer-winged breed of Odonata that lives in nests suspended above the jungle undergrowth. They stress harmony with nature, believing that Sha, the sun spirit, had told their race that enlightenment can only be achieved with this harmony. The Junas (the “Warriors”) are a large, red breed of Odanata that lives in grounded, organic Mounds that are connected with tunnels. Unlike the Shalen, they believe that they must shape the land in any way necessary for them to survive. Another race of insectoids is also important to Kairula. These are the Gnil, firefly-like creatures that are bred by the Junas for light. They are also sentient, however, possessing faculties of self-awareness, language, and tool-making. The Shalen see the Junas’s breeding as a violation of nature and free the Gnil whenever possible. When the WarpForce went to Kairula, both breeds of the Odonata realized that the Network is inimical to their ways of life. As such, their feuding has ended and they now ally with the WarpForce. *An interesting factoid—On Terra, “Odonata” is an order of the class Insecta that includes damselflies and dragonflies. Further Reading: Learn About and Visit Kairula! Offering Peace there would be a good idea. The Odonata are also good allies on a Chase to the Veil. Balen-5 is the fifth planet from the star Balen. Its climate is rather humid. One of the prominent plant species is the “Flower Findle,” a flower with amazing regenerative powers. It was also originally home to a large animal population from which the “Space Girls,” Sally, Suzy, Stacy, Sandy, Sindy, and Shelly, came, but a female intergalactic Overlord (Dark Madder) turned all of the animal life into Black Goo. Interestingly enough, this world is also where Dark Madder had her summer home. Further Reading: When the Space Girls Visit, we learn about and Explore Balen-5. All of these planets’ inhabitants have had some influence on AQ. Protus was a world long ago beset by the Network. The inhabitants of the planet are called Proteans. They are organometallic creatures that survive by symbiosis. Many of the inhabitants of the planet joined the Network, but there were still those dedicated to anti-Network activity; they formed the Protean Peace Alliance. It was said by a certain Protean Minister in the Network that the planet was largely taken overrun by Network agents, but Queen Pra’Mithia tells us that the planet is largely devoid of Network Proteans, as these have long since left the planet with the Network. The description of the Nechron Protean, on the other hand, tells us that half of the Proteans became Network Agents. As of now, however, this is of no consequence—Protus was destroyed by the Engine of Destruction. Protus was also an important world because of one of the artifacts in its Museum of Antiquity. This artifact, the Hand of Creation, is a powerful Gauntlet that has many incredible powers, as demonstrated by the hero of the WarpForce: it led the WarpForce to the Cryptic Veil to see the creation of a new world, destroyed a massive undead Leviathan on the planet of Satiren, and ultimately proved to be the Key to reverting the Engine of Destruction to its original form. There may be other powers that have yet to be seen. It was first discovered three “cycles” ago on Protus, when a beam of light pierced the surface of the planet and created a volcano that erupted and brought forth the Hand. Further Reading: The Protectors come to Lore, but we have to go to them to find the Hand of Creation. Terraformed and colonized by refugee Diceros, this planet was invaded by Giant Skitters, a product of native Skitters (the size of small insects) and a Network metamorphic solution. The WarpForce aided the Diceros in destroying the Giant Skitters and removing the metamorphic solution. Our friends met in the Mount Thrall Alien Bounty, Enlil and Enki, come from this planet. Further Reading: Enlil and Enki are only two representatives of their race that we meet at Mt. Thrall; you may see more if you Explore Dremin. Stoker-3 is a planet inhabited by 400,000 Chiropterrans**. Chiropterrans are bat-like creatures who do not believe in receiving technological help from others; as such, they do not yet have warp technology and must resort to slower-than-lightspeed travel. The leader of the Lorian Clan Nocturu, Noctros, is a Chiropterran. Stoker-3 originally faced a nanobotic virus that turned its victims into vampires. With the help of the WarpForce, the virus was eliminated. *An interesting factoid—On Terra, the man who wrote Dracula was Bram Stoker. **An interesting factoid—On Terra, “Chiroptera” is the Order of Class Mammalia that includes bats. Further Reading: Exploring Paxia will let you meet Noctros, but others of his race are best met when fighting Space Vampires! All of these worlds have succumbed to the Network or were under the power of the Autarchs. Aglon-11 was originally a planet used as a Network base. This base was originally used to capture and imprison Queen Pra’Mithia. It served another purpose in the Race to the Cryptic Veil; the antimatter power generator under the surface was used to blow up the planet to distract the Network’s forces. Further Reading: Saving Queen Pra'Mithia from the Network will introduce you to Aglon-11. Delta-7 was, at one point, used as a Nechron base. It was originally a hydrogen mine, but was destroyed in a two-pronged attack. Further Reading: The Two-Pronged Attack will let you destroy the Nechron base here. Purgos is a planet populated by Nechrons, natural Undead creatures. They were ruled by Veritos and Vanatia of Lore, as their necromantic powers gave them natural leadership. However, Veritos questioned the suffering caused by the Nechrons, while Vanatia embraced it. In the end, Vanatia became Dark Madder and put Veritos in Aguilos, a prison on a cliff on Purgos. With the help of the WarpForce, Veritos escaped and helped to end Dark Madder's evil. Purgos also has a sister world, Haden, that looks exactly like Purgos but is redder in hue. It is also populated by natural Undead, but they, the Hadeni, are subservient to the Nechrons. Omnus’s tale is a depressing one. Eons ago, the planet was inhabited by multifarious forms of life. The major sentient race of the planet eventually developed technology so far that they let their machines control every aspect of their lives. The machines were then given the minds of the inhabitants of the planet, and then all life on Omnus was also eventually transferred to machines. There were originally two factions of machines on Omnus, the Gathorans and the Defilers, but the Defilers, who lacked a moral code, unlike the Gathorans, forced the Gathorans out. The planet was destroyed when Dark Madder took the Engine of Creation from it after using the planet’s vast computing Core to find out how to change the Engine to one of Destruction. Prior to its destruction, however, it had become a place devoid of non-machine life and atmosphere. Everything on the planet was artificial and its biosphere was used as raw material and fuel for the machines of the planet. This planet was also notable because it was the source of many new technologies, e.g., tractor beams, cloaking, etc. Zirrix is a planet blanketed in an ionic, acidic atmosphere with poisonous oceans. All forms of "life" on the planet were bio-engineered to fit the needs of the major sentient species of the planet, the Virin. The Virin are parasites with 30% of their body mass in neural tissue that bond with other beings to control their bodies for their use. The planet is ruled by the Virin Confederacy headed by Jarik Z'kaa. Th'rix Na'thaar, a Virin scientist without the ability to bond, used an army of Nefadon to create the Nefadon Empire attempted to take over the planet, but then Dark Madder appeared and removed his higher thinking skills, ending the conflict. These worlds were destroyed or altered drastically from their original state. Gerendor was a planet of the Helas Binary Star System. It was originally a planet populated by a high-tech civilization of around 20 million people. After Gravlax’s monkeying with his time machine, the positions of the binary stars were shifted around 500 years ago, causing enormous catastrophes across the planet and ending the native life. 400 years after the destruction of the civilization, Defilers came to the planet, harvesting “Empyrean Cells,” which were powerful solar cells, from the dead Gerendorian civilization. Further Reading: Is it truly a Dead Planet? Lannox-3 was once a temperate/jungle/tropical world (for some reason, the game constantly changed its description), but Space Pirates Jayson and Karlina froze the world in a short time period of two months to sell the frozen water to planets without it. Because of the dramatic climate shift, the world was reduced to barren tundra. Further Reading: Fighting the Nice Pirates will bring you to Lannox-3. Other worlds that I have not categorized go here. Satiren is a beautiful planet covered entirely in water. There isn’t dry land anywhere on the island—that is, there wasn’t until Trinni created an artificial island in her escape from Lord Terror. An odd aspect about the planet is that its rings somehow orbit in different directions. Because Satiren is so different ecologically from Lore, there are a great many very interesting creatures that Lorians had never seen. One of these is the Gravanir. Since the creation of the planet, the Gravanir circled the Sea according to the seasons, causing all of the sea creatures in their vicinity to gather around them for their protection, forsaking their own migrations. According to Finnona, they aim for the preservation of order in the Sea. It also appears that the Gravanir can transmit a virus that gives other organisms the ability to transform into one of them. Although the Gravanir were native to Satiren, a sea serpent known as the Marix had recently been introduced to Satiren’s fragile ecology by the Network. They originate from the planet Dygith. These Marix serpents are almost viral in how they breed; one serpent can cause almost infinite trouble by producing extreme amounts of offspring, as they eat tons and tons of fish flesh per day. A final creature of note was the Leviathan. Note the use of the past tense verb “was.” The Leviathan was destroyed by the Hero using his or her Hand of Creation. Prior to its destruction, it had been raised as an undead creature by Dark Madder. The Leviathan appeared to be a creature of great power, devouring a Marix serpent in one bite. A final note: Despite the strange monsters, Satiren is a wonderful vacationing site—many Exos, for example, travel here for their vacations. Further Reading: Travel to Satiren today! Gervel is a gas giant populated by Proteans. It is a gas mining colony (naturally, since the world is a gas giant). The Proteans live on over 100 antigrav platforms situated throughout the planet’s atmosphere. Though the atmosphere is 5000 miles deep, the most valuable and rare materials are found near the core, where the already heavy gravity is strongest. One of the animal species that populates Gervel is the “Cosmoslug,” a creature of Darkness that seems to, oddly, have natural cloaking powers. They are “a cross between a giant bird and a snake-like thing, with four or so black eyes on long stalks. Black and purple in coloration…” Cosmoslugs generally live in outer space, in and around asteroids, but Gervel’s core is rich in elements that are of nutritional value to the Cosmoslugs. The move of the Cosmoslugs to Gervel caused problems for the Proteans, but the WarpForce helped the Proteans set up a sanctuary for the Cosmoslugs on Gervel. Further Reading: Why not Explore Gervel at the behest of Milly Mendas? Nemea is a plant consisting of dense jungle and swamp. The planet was originally populated with Predecessors, but they left the planet when the species they hunted all went extinct. A hunting party of Predecessors brought Alien Zards to the planet to hunt the Alien Zards for pleasure on their planet. Further Reading: Although Terra had a Nemean Lion, it wasn't from Nemea; you'll find out what DOES live there if you Explore Nemea. Erakkis (or “Abiding Home” in the language of the natives) is a desert world, and very little water is to be had on its surface (there are no seas). Its dominant race is one of humanoids called “Freemin.” The planet is the only in the universe that has “Spyse,” (Yes, Spyse is a play on “Spice”) a byproduct of the digestive system of the “Doon Worm,” a native species of giant worm. This and the fact that Spyse is difficult to find cause it to be a very valuable (and the only) export of the Freemin. The Freemin are led by the “Spysers Guild,” who use the Spyse to transport objects through warpspace. They live mainly in cities that have parts both above and under the ground, with the underground portion being the majority to prevent loss of water by evaporation. They also wear Armor that prevents loss of water through evaporation. The Freemin believe that there is to be a savior of their world called the “Mo’Ad-Lib,” though what this “Mo’Ad-Lib” must do to save their world is unclear. Further Reading: Rap artists and more ad libs abound on Erakkis; try Exploring the Sands of Doon. This planet is the last planet (in the sense that all of the others were long ago reduced to asteroids) in the Epsilon Minor System. It was a temporary home for a few Silari Drakel that called and ambushed the WarpForce. Eventually, these fugitive Silari were attacked by bounty hunters. Further Reading: Epsilon Minor isn't all that interesting, just so you know. Capurnia is a planet inhabited by Space Moglines. These “Moglines” Moglins from Lore, brought to the planet by Emperor Twang, a clone of Twig created when Twig accidentally teleported two places at once. They have since formed two factions, the “Loyalists,” who believe in Twang’s powers, and the “Traitors,” who don’t even believe in his existence. When the WarpForce visited, they made Twang come out of his temple and re-unite the two factions into one that would help the WarpForce. Further Reading: The Space Moglines were brought to Capurnia by Twang; meet them on a mission. Ajerak is a “tropical paradise,” to quote Sergeant Lucky Gibbs. The jungle by which the planet is covered is very much like that of Lore, probably because the evolutionary paths taken by the native plants were similar (or it could be that the Dhe Ehm decided to re-use Dark Jungle art!). It was once visited by the WarpForce to try to negotiate the return of Colonel Ba’Tokk; all they received was a Defiler-created machine version. Further Reading: You'll see Ajerak if you try breaking Ba'Tokk out of jail. Hennaooine is a small desert world. About a quarter of the planet is covered with ocean, however. The planet is inhabited by Gathorans, intelligent machines that were once from Omnus. The third-to-last Star Knight, Opie-Juan, had also made this planet his temporary home. Further Reading: Will you Find Ken Benobi? Syrine IV was originally a barren world before its current inhabitants, the Unaga, terraformed it to their liking. The only inhabitants, the Unaga, are a very singular race. They originally hailed from the planet of Unai, but this world was destroyed around 300 years ago when the sun of the system went supernova and became a pulsar, gamma ray-blasting the planet into oblivion. All but 960 of the Unaga, traveling in 40 fighter ships, were destroyed. These have since colonized 14 planets with 19 billion Unaga, and continue to do so today while searching for their forebear, the Unaga Prime. They wield great power, using incredible combinations of magic and technology that are not available to most any other race. The Unaga owe their great power to the “Dragons,” or “Sacred Ones,” of their planet, which now live in outer space after the destruction of their planet. On Unai, these Dragons used to grow in power as they aged, subliming or exploding when their power grew too much for their bodies to handle; the Unaga siphoned off this extra power to store as Crystallized Dragon’s Breath. When the planet was destroyed, they no longer needed the Unaga and roam in outer space. These Dragons are very different from the Dragons of the planet Lore, as they are hydrogen-based in their adulthood and carbon-based in their childhood, existing in a hibernating phase between these two states. The adults, due to their hydrogen-based nature, feed off of radiation sources to survive. They are also many times more powerful than Lorian Dragons, creating more Crystallized Dragon’s Breath in a year than 1000 Lorian Dragons could in a century. Further Reading: Will you learn of the Enemy Mind and meet the Star Dragon? Novus is Lore’s sister world, created by accident when the hero of the WarpForce undid the programming that transformed the Engine of Creation into one of Destruction. Its atmosphere and gravity are exactly like Lore’s, but the lifeforms are completely different; apparently, the Creation merely resulted in a world that matched Lore on a planetary scale. On our brief visit to this sister planet, we encounter several types of lifeforms. The dominant lifeform was a very intelligent beetle-like creature called a “Greetle.” These Greetle seemed to be telepathic, or to have a hivemind. Another important being was “Rubia,” someone that looked very much like Vanatia of Lore. Further Reading: Brave a New World! A lot of arcane and esoteric terminology gets thrown around in several of AdventureQuest’s writers’ writings (particularly Falerin's own), and a lot of it gets jumbled around and forgotten about, and possibly badly misinterpreted. This Guide will attempt to compile a list of explanations of the origins and natural science of the near Omniverse in its entirety. Note that you are expected only to have encountered in-game storyline material to be able to understand this Guide (see the Storyline Order Guide for help with this), so you needn’t go searching through old Truthseeker IRC Logs, though this Guide may direct you to various places if you wish for more information. To continue on the Onion Model it is important to discuss the Gods. The highest level of deity, as mentioned here, is a Dhe Ehm. The term “Dhe Ehm” isn’t merely a fabrication with no significance, however. The term “Dhe Ehm,” like the names of ElBhe and his Litter, is the sounding out of the letters it means to mean – DM, a Dungeon Master. The Dhe Ehm are the aforementioned beings of a more prime level of Creation, of the Omniverse. They come in two varieties – realized and unrealized. In our Terran lingo, a realized Dhe Ehm is any creative thinker who has realized his or her potential (and an unrealized one is one who has not). A being like Falerin, James Cameron, or Lemony Snicket is a realized Dhe Ehm – he or she has created a world, a universe, on a less prime level of the Omniverse, and can do pretty much anything to or with that universe. Some Dhe Ehm choose to create other deities in their worlds. Let us clarify this term in terms of the known multiverse relative to our Lore. The word “deity” is extremely difficult to define. Between a mortal and a deity, there is this difference: assuming that there is an absolute ceiling to the power a mortal being can have, a demipower breaks that ceiling and a deity demolishes it. Many deities gain power from their worship. This is not universal, but it is part of the definition that is central to the system. Foreign deities are a complicated matter. Foreign deities are recognized by their power and the recognition of their own pantheon if Caelestia recognizes that pantheon as valid (i.e. has diplomatic relations). Where no diplomatic relations or recognition of the beings claim exist, a being that might from every other sign appear to be a deity will, to the Caelestian pantheon, be a usurper, not a deity. Deities in the near multiverse all lack the power of full omniscience, as it violates free will; if you already know all things, no one can act in a manner contrary to that knowledge. That someone knows the outcome means you are forced to act in accordance with their knowledge. You can never truthfully be a free agent. Because manifesting directly can potentially violate free will, deities make use of Avatars and golems. Avatar: Any form, object, being, device, sample or representation of a deity’s power directly and identifiably evident in the world. Also known as a manifestation or a mirror. Examples include Giliara Celegra of the Light Lord and Lanfiré Dupre of Falerin. Golem: An artificial being animated by magic or divine force that is not truly alive. Also called a simulacrum. Examples - None of deities, but the golems summoned by Zadd and other Golemancers are similar to deific golems. Deities are important to natural science because they created the universes (obviously). How they do so in the near multiverse is explained in the next section. According to the Archmage Warlic, all of the near multiverse is, at its very base, composed of magic. Drawing upon many centuries of study, I have come to see that the basic building blocks of the multiverse are magical in nature. This, for the most part, is believed to be true and has been confirmed by several different sources. It appears that the raw stuff of the universe is something we are all familiar with, but that very few people genuinely understand to a thorough degree. The raw stuff of the universe is Void energy, also known as raw mana. In this way, Warlic’s studies are confirmed – the universe is indeed made of basic building blocks that are magical in nature. To more fully define “Void”: Void is the raw stuff from which all things spring; it’s both elementally aligned to all elements, hostile to all elements, and unassociated with all elements. This Void energy used for Creation comes from the “place” called the Void, also known as Limbo. (Void energy, however, is not only used for Creation. It comes in two varieties – Uncreation-aligned and Creation-aligned. The difference between the two will be covered in a later section.) In the process of Creation, Void becomes Creation-aligned and is then shaped in all sorts of Creative ways. It seems, however, that Creation is often imperfect – pockets of primordial Creation, also known as Creation-aligned Void energy, remain in worlds created from Limbo. During the process of Creation, sometimes, pieces of the force of Creation, pockets of other dimensions become trapped in the material realm, bending it locally. These pockets are older than the Creation and exist outside of it, and thus can reshape it utterly. Caelestia has a very large such pocket, an uncontrolled realm known as the Planes of Instability that has a mind almost of its own. Lore has more than one such region, but each of them is segregated, and none of them are obvious to the average adventurer because they do not have the same sentience and power. But a powerful enough force could still bend these pockets to their use. The Drakel realized this long ago and sought to isolate these pockets. Trap them inside of deep underground places and inside of devices using magiscience so that Creation itself could not be used to Uncreate and cause destruction. [The Deep,] however, is one of the largest pockets of uncontained energy I have been able to discover. It was large enough that the Drakel failed utterly to trap in their devices and instead covered it with their mountain. The magic’s that allowed this required the willing sacrifice of some 2 or 3 million Drakel magi over a 200 year span. This occurred sometime shortly after The’Galin last left. The magic so altered the movement of the continents and the mountains and seas, that even today Lore is substantially more geologically active than most worlds five times its size. The Deep was described as a reservoir of primordial creation left over from the creation of Lore. That would suggest that it is in fact a rather chaotic mix of all sorts of energies likely both elemental and not including potentially Void as that is the raw stuff of the universe. However it is aligned for the purpose of creation so it is not pure void. The Engine of Creation appears in a location in deep space where it “knows” a planet is to be created. Avatars of the Elemental Lords manifest in this location. These Avatars proceed to create using the Engine. The process of Creation on Lore established element-aligned mana. The planet itself has a core composed entirely of elemental magic, setting it apart from many other worlds that lack magic. Seth Cay Dhows (okay, not necessarily reliable, but I will take him as truthful here) has said that certain forces antedate the elements – the forces of Truth, Lies, Life, Death, War, Peace, Transient, and Eternal – but that the elements were an attempt by the Elemental Lords to imbue aspects of themselves into Creation (via Primal Representatives like the Avatars and objects like the Orbs). The elemental magic of Lore is a manifestation of the Elemental Lords. It seems that the integration of the elemental aspects of the Elemental Lords into Lore is integral to its existence. A direct, full manifestation of the Elemental Lords would destroy the boundaries between the elements and unravel reality. The elements are also a big part of Lore’s magic users’ magic, which is discussed in the next section. Most of the magic cast on Lore manifests itself as a spell. A spell is a "template" or psychic construct through which one channels mana to produce a desired effect (as opposed to dumping elemental energy in someone's face). According to Falerin, this magic comes in four varieties on Lore: Metamagic, Elemental Magic, Non-Elemental Magic, and Divine Magic. Metamagic, as its name implies, is magic used to alter magic. At a very basic level, it can change structures of spells. Class Skills learned as a Mage (e.g., Focus Spell, Empower Spell) are types of metamagic. On a higher level, one can call the magical foundations of the world a “spell,” and metamagic can change the structure of the world. The bizarre flecks, for example, have this sort of metamagical effect on the world. Elemental magic is one of the most familiar types of magic to most of the magic users on Lore. On Lore specifically, it involves the manipulation of element-aligned mana inherent to the world. For this reason, much of the magic familiar to Lorian magi and wizards is inaccessible in deep space or deep Void, which are very similar in nature – they both contain non-Elemental forces hostile to the elements and very little elemental mana, spread very thinly. A core of elemental mana, like that of Lore, is almost essential to this brand of magic. Kalanyr does not, however, that a Mana Core is not, strictly speaking, necessary for performing magic; it just makes things many, many times easier. For many, magic is either impossible or significantly reduced in the effects it can achieve without a Mana Core, as it provides large amounts of mana in a small area. In space, mana is much more thinly spread (and frequently more raw, though there's still some elemental alignment going on from various effects) which makes it harder to gather and use. and unrelated Elements are two away from each other. An example of elemental magic that does not require such a core is the Electromagnetic-Gravitational Force, more commonly known as the UniForce. According to one of Kalanyr's theories, the UniForce is essentially magic aligned with Energy from various cosmic forces that is not used to full efficiency, as it seems limited in its capabilities compared to the magic that is available to a Lorian Wizard. The final brand of magic is divine magic, which is distinct from the others only in that its definition involves the spellcaster. Divine magic is magic used by a deity and may be used to emulate any of the aforementioned magics. Magic on Lore, however, isn’t always Lorian Magic. It can also originate from a different dimension, in which case it will appear as a local type of magic. Magic with “elemental” appearance (say, a “frost” element from another dimension) would align itself with the local elements (“frost” would probably become Ice). Magic with an incompatible appearance (from a world without a compatible elemental structure, like a “curtain” element) would align itself with Harm, which is merely energy without elemental alignment (distinguished from Void by the fact that “Void energy is more complicated, it’s the raw stuff from which all things spring, it’s both elementally aligned to all elements, hostile to all elements, and unassociated with elements,” as aforementioned). Particularly powerful magic from another dimension that doesn’t fit into the Lorian elemental structure (say, Eldron’s) will appear as non-elemental magic on Lore (in other words, Void). To cement the idea of Lorian magic, I will take a look at one of the most misunderstood practices of magic on Lore - Necromancy. Necromancy is not in any way evil, and it is not in any way merely a Darkness Elemental Magic. Assuming "Necromancy" refers to "the raising of the dead," Necromancy can involve any power source - this includes any sort of elemental magic (again, it does not have to be Dark), non-elemental magic, and even technology (the bounty hunter Rhapsus, for example, is an Undead reanimated using technology) - as Necromancy substitutes energy for a soul ("the essence of life," according to Truth). Furthermore, "raising the dead" includes Resurrection, a skill often practiced by Paladins, despite proclaiming themselves the sworn enemies of all Necromancers. The former can be used to give Void, which is nothing, potential to “exist” and effect change on the universe, while the latter will remove this potential. This is a poor explanation however, and does not fully cover the intricacies of Creation and Uncreation. This is probably a poor explanation but Creation is making something from Void energy, Uncreation is returning the thing to Void energy. Even thats a poor version of a poor explanation since when you create something you also create its potential for interacting with other things (a potential for having a history if you will), when you Uncreate something you remove the thing and that potential (so the thing never existed). For example, Uncreation can be used to Create, as in the case of Absolix – one can Uncreate the nonexistence of something, it seems. In addition, not all Uncreation is as final as removing something completely from existence – it can be used partially to destroy, as Dark Madder did to the planet Corus/Coren, creating “bizarre matter,” a form of Uncreative energy that can warp worldwalls, derange interdimensional magic, and retroactively condition reality. Uncreation is also a temporal phenomenon. According to Falerin, all Uncreation has its roots in chronomancy. [17:37] Falerin: "All uncreation invovles Chronomancy"
A more precise explanation of time is below. Time. An incredibly confusing concept, undoubtedly. 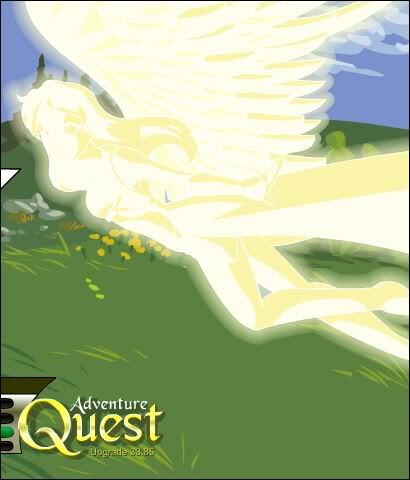 MechQuest, DragonFable, AdventureQuest, and AdventureQuest Worlds are said to be set in different “timelines” with many “analogues” – but what does this mean, exactly? For this, we look toward the Lorian Codex of Deeper Mysteries. Time proceeds (“flows”) in one direction – before to after, past to future. It does not, however, take the most direct route, or indeed only one route. Just as there are forks in a river, choice and decision produce “parallel” timelines that also flow from past to future, though not necessarily the same future. In the end, however, time tends to convergence and separate timelines tend to recohere – that is, to become one timeline again. This is defined as a natural type of Uncreation, and is much like how rivers tend to converge in some larger body of water, whether a pond, lake, sea, or ocean. An analogue is a being in one timeline that shares history with another. When a being can make two different decisions, time splits into two timelines as mentioned above, and that being is also split into two analogues in these separate timelines. This is analogue by divergence. It is also possible to have analogues by convergence. When two distinct beings choose in similar fashions, they can cohere for a time, much like Seth Cay Dhows and the Mysterious Stranger of the DragonFable Lore combined for a while. In times they are not separate, they are also called analogues. Analogues can also be formed by reality splitting. Warlic and Warlicia are analogues created by Loco’s reality splitting and Celestra used the Gauntlet of The’Galin to finely split Jano into two analogues as well. As mentioned above, time is wont to converge. This rule is so prevalent that even deities follow it. Different timelines want to become as similar as possible, which explains why many worlds have very similar denizens. Elves, Orcs, Humans, Dwarves, Gnomes – they aren’t Lorian only. You see them in many other places – Azeroth, Middle Earth (and other Terran worlds), etc. – because of time’s tendency to converge. In fact, true divergence – true difference in timelines – is extremely rare; most appearances of divergence are in fact only variation. True difference can actually produce bad effects on the structure of time. According to the Codex, time is structured by something like a “mold,” and true divergence produces “cracks” in this mold that can be reused, recreated, or otherwise. This is most likely an explanation for the Reset. As for the specific timeline of Lore itself (or, rather, themselves), one would be best off by referring to a rudimentary temporal "map" created by Falerin - here. Note that it's not entirely accurate, as it implies that the Great Fire Wars in DragonFable and AdventureQuest occurred at analogous points on separate timelines - which they didn't. It appears that the rules of the Lorian universe are actually very similar to those of our own Terran universe. Travel is limited by the speed of light, the laws of thermodynamics rule, etc. The only difference is that magic can bend these rules. The Shattered Worlds (see this quest), for example, obey no laws of physics but for the ones travelers bring to them. And that is the Natural Science of the Near Omniverse. ArchMagus Orodalf for his work on the original guide, "AdventureQuest Storyline Guide" and "Godly Guide to the Gods"
18/11/11: Added links to "Conquest", "Cat-Napping" and "A Mysterious Visitor"
06/12/11: Added links to "Element of Surprise" and "Paxia Under Siege"
11/12/11: Added links to "The Burning Sands" and "With Fiends Like These"
15/01/12: Added the Frogzard Hunter quest chain and April Fool's seasonal quests. 16/01/12: Added directions, notices and Falerin's fan-fic. 05/05/12: Added "Guardian Dragon War" and "Wyvern Riders!" 17/06/12: Added "Looking for Leads: Ku Ku! ", "An Eggcelent Adventure" and "Shock to the Heart"
20/07/12: Added links to "Looking for Leads: Ku Ku! ", "An Eggcelent Adventure", "The Father's Door", "Star Blecch 2!" and "Dhows' True Form Revealed"
25/07/12: Added links to "Shock to the Heart", "Return to Paxia!" and "Journey Home"
31/12/12: Added links to "Paxian Patrols", "The Fallen Fisherman", "Light in the Dark", "Rise of the Loremasters", "Bizarre Flecks: Epilogue", "7: Artistic Ruins", "8: The Legend of Lady Tomo (A Lady's History)", "9: Building Truphma: Part I (Boring Boring West? )", "10: Building Truphma: Part II (Colour on the Inside)", "11: Building Truphma: Part III (Painful Promises!)". Timeline schematic included, thanks to ArchMagus Orodalf. Reorganised guide: split main sections into individual posts to prepare for the synopses which will be added. 01/01/13: Moved sections around to better fit the recommended play-order. 12/08/13: Added the "Absol-ution Saga" and "16: Golems at Granemor!". 28/11/13: Absorbed ArchMagus Orodalf's Storyline Order Guide. 25/12/13: Absorbed ArchMagus Orodalf's "Godly Guide to the Gods." 10/07/14: Absorbed ArchMagus Orodalf's "Guide to the Planets of AdventureQuest" and "A Guide to the Natural Science of the Omniverse"
Thanks for taking everything over. :P You might want to remove the broken image in the section "Origins of the Near Multiverse." where is a quest you can find out nightbanes history. Could you tell me the updated order of the darkovia quests? I just finished the moglins 1-3 but then went to the shadowslayer/nighthunter and i'm pretty sure the intro is in the future. I would recommend putting the old link: http://forums2.battleon.com/f/tm.asp?m=3829370 in archive.org and seeing if it has an archived version of the old thread as I suspect the new entry with old quest information is incomplete as it lacks the boss monster dialogue. I cannot edit the third post at the moment to revise the quest order information but, as you mention, ShadowSlayer and NightHunter both skip well into the future and it does not make sense to play through it before playing through the Devourer and Bizarre Flecks Sagas. I would recommend playing these quests, then, after completing the Devourer and Bizarre Flecks Sagas (inasmuch as Dhows/Erebus is concerned with the latter) so that things make sense. I will edit this information once I return to Australia (I am in China right now). Thank you very much for reminding me as I had forgotten! What is the (Lorian) chronological order for the quests focusing on Erebus? And, besides seasonal events, what, if any, are the side-story quests and where/when to they occur? Yeah, it's a sad thing that most of the guides and wikis on the forums (and outside) are at least half a decade outdated. It's like everybody stopped caring about the game. May Time, ever fleeting, forgive us. We who have forsaken your song, and buried our future. I am going to go ahead and just lock this. There is a single constructive post in its entire history with the rest being questions and random complaints which don't belong here. If you have a question there is AdventureQuest Q&A, if you have a complaint about a lack of updates or guides feel free to step up as an owner. Apologies for the extended leave of absence. I'm currently updating the play order, please bear with me.